Vincent Damon Furnier was born on February 4, 1948, in Detroit, Michigan. Furnier's family moved to Phoenix, Arizona, and Vincent began writing songs. While in school, Furnier formed a band that played local dances. In 1968, Furnier's group changed its name to Alice Cooper. Furnier claimed he was the reincarnation of a seventeenth-century witch of that name. In 1969, Frank Zappa signed Alice Cooper to his Straight Records label. They released a few albums and in 1971 they released their first hit single, "Eighteen," which reaced number 21 on the US charts. In 1972, they had a top 10 hit with "School's Out." Several bestselling albums followed. 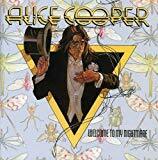 After Welcome To My Nightmare, Furnier adopted the name "Alice Cooper" for himself. Cooper continued to record and also started acting in films and on television. In 1989, he had a top 40 hit with "Poison." In 1992, he appeared in Wayne's World.